There is another interesting element in Putin's game. It's Russian uranium. Every sixth light bulb in the USA depends on its supply. Which Russia sells to the US too, for dollars. China recently announced that it will cease to increase its gold and currency reserves denominated in US dollars. Considering the growing trade deficit between the US and China (the current difference is five times in favor of China), then this statement translated from the financial language reads: "China stops selling their goods for dollars". The world's media chose not to notice this grandest in the recent monetary history event . The issue is not that China literally refuses to sell its goods for US dollars. China, of course, will continue to accept US dollars as an intermediate means of payment for its goods. But, having taken dollars, China will immediately get rid of them and replace with something else in the structure of its gold and currency reserves. Otherwise the statement made by the monetary authorities of China loses its meaning: "We are stopping the increase of our gold and currency reserves, denominated in US dollars." That is, China will no longer buy United States Treasury bonds for dollars earned from trade with any countries, as they did this before. In this brilliantly played by Putin economic combination the physical gold is rapidly flowing to Russia, China, Brazil, Kazakhstan and India, the BRICS countries, from the reserves of the West. 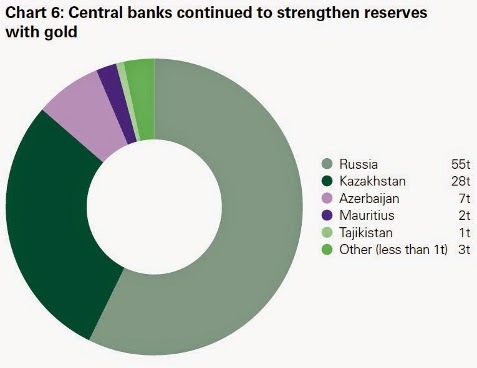 At the current rate of reduction of reserves of physical gold, the West simply does not have the time to do anything against Putin's Russia until the collapse of the entire Western petrodollar world. 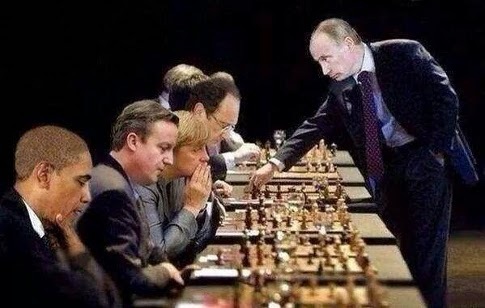 In chess the situation in which Putin has put the West, led by the US, is called "time trouble". What the BRICS countries, led by Russia and China, are doing now is actually changing the role and status of the US dollar in the global monetary system. From the ultimate means of payment and asset accumulation, the national currency of the USA, by the joint actions of Moscow and Beijing is turned into only an intermediate means of payment. Intended only to exchange this interim payment for another and the ulimate financial asset - gold. Thus, the US dollar actually loses its role as the ultimate means of payment and asset accumulation, yielding both of those roles to another recognized, denationalized and depoliticized monetary asset - gold. Because, firstly, the population of Russia, unlike people in many other countries, does not wish to exchange their freedom and the future of their children for Western kielbasa. This is evident from the record ratings of Putin, regularly published by the leading Western rating agencies. Personal friendship of Washington protégé Navalny with Senator McCain played for him and Washington a very negative role. Having learned this fact from the media, 98% of the Russian population now perceive Navalny only as a vassal of Washington and a traitor of Russia's national interests. Therefore Western professionals, who have not yet lost their mind, cannot dream about any color revolution in Russia. NB. From the article- "This truly brilliant economic combination by Putin puts the West led by the United States in a position of a snake, aggressively and diligently devouring its own tail." Once this picture is understood, one can readily understand, on the one hand, the time constraints that the Empire is under and therefore their rush to make as much mayhem around the world that they can and, on the other hand, the seemingly inexhaustible patience that Putin is displaying. It looks like Fort Russ needs a place on our sidebar. Anybody know how to do that? And it looks like our software is due for the latest update... hopefully tonight I'll do it. Putin could deep-six the American economy within weeks by dumping all those T-bills Russia has and continue to sell oil and NG in any currency except the USD. But our politicos are so used to beating up 3rd world nations and thumping their chests in Congress showing how tough they are to the other Hill apes that they've redefined stupidity. Then there's Obama, who couldn't be doing a worse job if he tried, or maybe he is trying, trying to serve his Masters in Tel Aviv and Wall Street, neither of whom give a damn about We the People. Thanks for your comment, Catman. I believe the Russians (and the Chinese) have held off dumping US Securities to crash the US economy in order to safeguard their own interests and the interests of their trading partners (other than the US). By aiming for a 'soft landing', the Russians are maintaining the maximum level of world trade and prosperity while still protecting their own sovereignty as much as is possible. 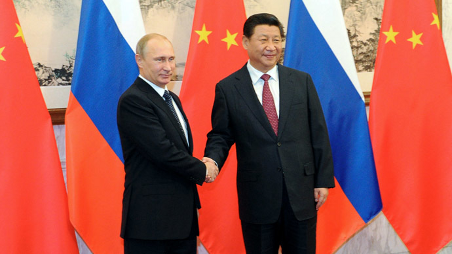 Even if I'm right, it's still a judgement call on the part of the Russian and Chinese govts. However, the Russian govt is not entirely a free agent (completely sovereign) in this matter as it has made commercial agreements with the IMF which the Russian Government is bound by so long as they still agree to be bound by those agreements. It sounds a little circular or even non-nonsensical until you realise that there is at least one faction (known in Russia as 'Liberals") within the Russian power structure that is antithetical to Russian national interests. One critical condition of this agreement with the IMF is that the Russian Central Bank will limit the issuance of its own currency in proportion to the US securities it holds in foreign reserves. This, I dare say, limits the Russian govt's ability to dump these same securities without damaging itself. This situation can be changed through Russian legislation and an attempt was made to do so a few weeks ago and failed. Some months ago, another commenter proposed basically that Nabiullina (the current head of the central bank) was in the pocket of the IMF and I disputed that because she was previously an advisor to Vladimir Putin on his staff and that he had appointed her to the Central Bank of Russia. It followed, for me, that she would be sympathetic at least to Putin's economic vision and would implement his policies. It turns out that that was not the case and the commenter was right. I have to conclude (unsurprisingly) that there is information I am missing or I have made conclusions based on wrong information. It will be interesting (not to say crucial) to see how this plays out.